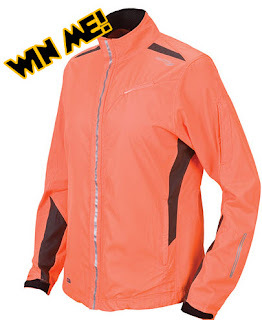 RunnerDude's Blog: Enter For Chance to Win a Free Saucony Sonic ViZiPRO HDX Jacket! Enter For Chance to Win a Free Saucony Sonic ViZiPRO HDX Jacket! In January, I posted a review about Saucony's awesome new jacket, the Sonic ViZiPRO HDX, with the great nighttime visibility fabric, 3M reflective strips, and the awesome USB LED piping on the front and across the back of the jacket. Now you get a chance to win the jacket! Saucony has been kind enough to provide one free jacket to give away to one lucky RunnerDude's Blog reader! The jacket comes in a men's and women's version (women's shown in picture).The jacket retails for $110!! So, don't waste any time! Enter today! Winner will be annouced on the blog on Feb 17th! See below to enter! Best of Luck! Is this a Women's jacket or a Men's? It comes in a men's and women's. The women's is shown in the picture. The men's version is identicle just different sizes. Since they are identicle I didn't show both versions. If a man wins, he'll get the men's version and a lady will get the women's. I hope you don't mind if I'll link your contest on my blog. Hi Jane! Sure is! Best of luck! That's great to hear. many thanks.